Get ready for 5G wireless connectivity. The results of a new study posted this week by market research firm IHS Market indicates 12% of North American mobile operators are planning commercial 5G rollouts by year’s end. So what, you might ask, does this have to do with HD or 4K Ultra HD video? The study found the second highest rated use case for 5G–behind Extreme mobile broadband (eMBB)–was real-time video gaming, which will require eMBB to operate. “As real-time gaming requires a super-fast network with low latency, it cannot occur in the absence of eMBB; the same applies to high-definition (HD) and ultra-high-definition (UHD) video services and tactile low-latency touch and steer,” said Stéphane Téral, executive research director, mobile infrastructure and carrier economics, IHS Markit, in blog on the IHS site this week. In addition, video-focused company’s like Taiwan’s Foxconn have cited the approaching “8K/5G” ecosystem as motivation for the establishment of new 10.5 Gen 8K and 4K video display panel fabs, anticipating a rapid ramp up in native 8K content made possible by more robust eMBB bandwidth to be used in the creation and distribution of the higher resolution content. 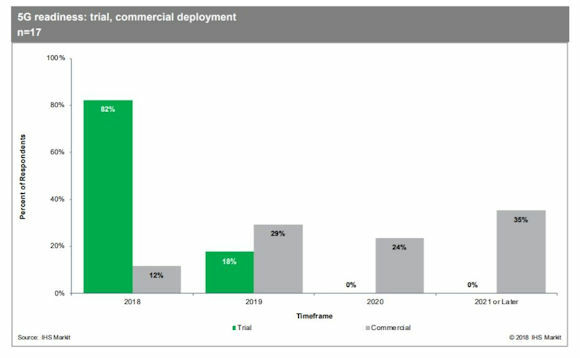 Regardless, most respondents expect fixed-wireless access (FWA) to be ready for commercial deployment first, ahead of eMBB. The 82% of operators polled in the study as trialing 5G rated ultra-low latency (ULL) the chief technical driver, followed by decreased cost per bit (76 percent) and increased network capacity (71 percent).